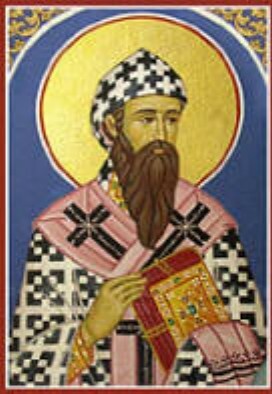 Saint Cyril of Alexandria (376 – June 27, 444) was the bishop of Alexandria who zealously defended Christ's divinity against the leading heresy of the day, also known as the champion of orthodoxy. St. Cyril was a monk, as archbishop he was the central figure in overseeing synods, presiding as the pope’s representative. Cyril was a great theologian teacher of the early Church, a man of great courage and force of character. Cyril wrote treatises that clarified the doctrines of the Trinity. He had an strong devotion to the blessed virgin Mary and defended her divine motherhood and the Incarnation. Served his episcopate for nearly thirty-two years. Saint Cyril was declared a Doctor of the Church by Pope Leo XIII in 1882. Cyril was born at Alexandria, Egypt. He received a classical and theological education at Alexandria and was ordained by his uncle Theophilus, then Bishop of Alexandria. Cyril would succeed his uncle on Theophilus' death in 412 and only after a riot by the followers of his rival Timotheus. As patriarch of Alexandria, Cyril immediately went after the heretics of the Novatians. One of his first acts was to pillage and shut the churches of the Novatian sect. He would be criticized for violence that took place. Next, he would turn his full attention to the Jews of Alexandria. The Jews had a flourishing community there ever since Alexander the Great but they had caused tumults and had massacred Christians. Cyril led a mob which drove all Jews away from Alexandria in 415. Some historians also blame him for the murder of pagan mathematician Hypatia of Alexandria, in 415. Cyril took part in a synod and agreed with the premise for the deposing of St. John Chrysostom, who also became a Doctor of the Church. Also, St. Cyril would oppose Roman emperor Julian the Apostate. Cyril is famously known for leading the opposition to bishop Nestorius of Constantinople. Nestorius would not agree to the title Theotokos, “God-bearer” for Mary. He said Mary was not the mother of God but only of the man Christ. Nestorianism implied that the humanity of Christ was a mere disguise. Cyril represented the Pope at the Council of Ephesus in 431 and condemned Nestorianism as heresy. In the confusion that followed, supporters of Nestorius would arrange their own synod and Cyril was deposed and imprisoned for three months. Papal legates would confirm the council's actions against Nestorius and declared Cyril innocent of all charges. The result, Nestorius was forced into exile. Cyril died of natural causes in 444 a.d. and his relics remain in Alexandria. Cyril's writings are characterized by accurate thinking, precise exposition, and great reasoning skills. Seventeen books "On Adoration in Spirit and in Truth"
Only if it is one and the same Christ who is consubstantial with the Father and with men can he save us, for the meeting ground between God and man is the flesh of Christ. Only if this is God's own flesh can man come into contact with Christ's divinity through his humanity. Because of our kinship with the Word made flesh we are sons of God. The Eucharist consummates our kinship with the word, our communion with the Father, our sharing in the divine nature—there is very real contact between our body and that of the Word. This page was last modified on 10 September 2016, at 01:32.